Los Angeles — Twenty years ago this November the Hammer Museum first opened its doors. 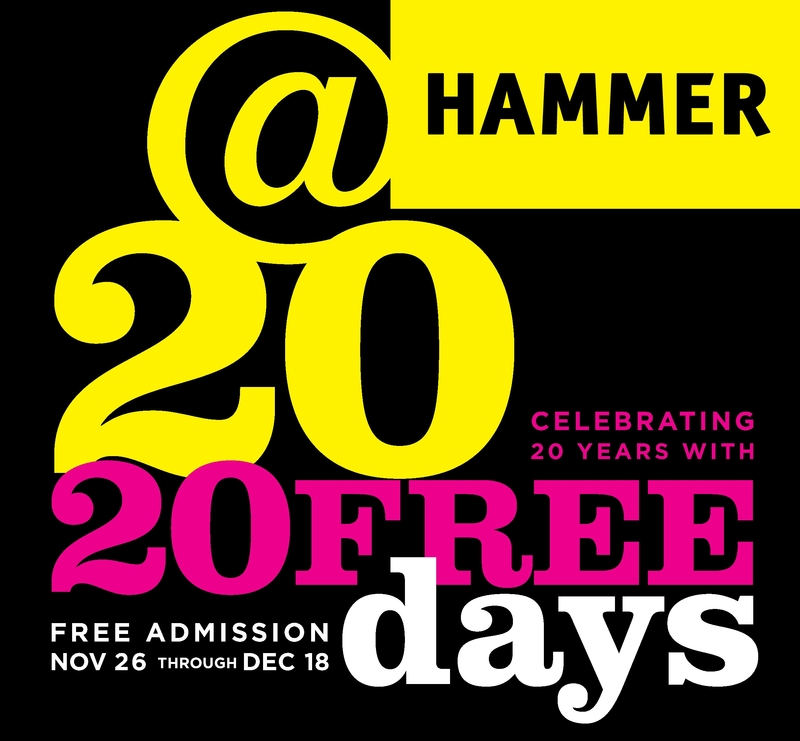 To celebrate the occasion, the Hammer is offering 20 DAYS OF FREE ADMISSION, November 26 to December 18. Visitors are invited to bring family and friends to enjoy world class art exhibitions, public programs including screenings, readings and lectures, an open air courtyard with a full-service café, and one of the best bookstores in the city. When the Hammer opened to the public in 1990, it was a museum dedicated to the vision and collection of one man — Armand Hammer. In the twenty years since, the Hammer has grown remarkably, presenting an impressive array of art from the classics to the cutting edge. “It is hard to imagine that only two decades ago a parking lot and gas station occupied the space where the Hammer now stands. Over the last several years we have worked hard to make the Hammer a thriving public museum, urban gathering space, and university hub,” remarks Hammer Director, Ann Philbin. In addition to offering 20 days of free admission, the museum is also offering discounts in the Hammer Bookstore. For the entire month of December, design books will be 50% off in the store. With approximately ten thousand titles, the Hammer Bookstore is renowned for its extraordinary range of books on art, architecture and design. The store also offers a unique selection of jewelry and gifts, and includes items handmade by local artists. UCLA students, faculty, and staff always receive a ten percent discount, and members of the Museum and Friends of the Graphic Arts also receive discounts.